I am writing this nearing the end of the day from one of my rig locations. I am so blessed with an exciting new oil field life since moving out here five years ago. I’ve had the opportunity to build my empire through dedication, discipline and hard work, allowing me to give back to those who helped me along the way. The opportunities here in North Dakota are endless. I knew that I needed a change after losing everything through a divorce. I wanted a chance to find a new job and recreate myself. Coming to North Dakota and discovering the oil field life has been the best thing that has ever happened to me. I have my life back surrounded by genuine friends and family. At a young age, I was given a tremendous amount of responsibility that I attribute to my strong work ethic and survivalist mentality. During high school I thrived in tomboy activities such as auto mechanics class. I started out as a history major after high school at the University of Minnesota then changed direction to ancient art history. During this time I was taking care of my homeless mother and working two jobs just trying to make ends meet. I spent my days going to class, delivering auto parts and waitressing. It was the discovery of Rush Limbaugh, my very first mentor, that inspired me to come up with my own radio show. I decided to take a break after college and ventured to Vail, Colorado selling cell phones. Two years later I moved back to Minneapolis and entered the corporate world of sales. Corporate America wasn’t my niche and after 10 years with the company and changes in economy, I needed to find a way out. I walked away from my family and my life as I knew it to start over in North Dakota. Today I walk tall in a man’s world with the love and respect from my fellow company men. Oil is in my blood now and it will be hard for me to ever leave. I’m fortunate to have a myriad of thriving businesses – Isabella’s Oil Field Services Cleaning, catering, and brokering diesel fuel. 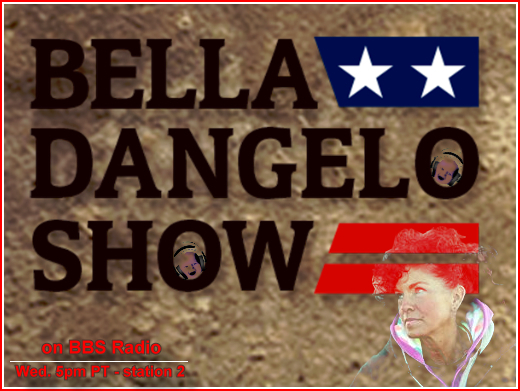 One of the most fulfilling has been my little known radio show, The Bella Dangelo Show. It combines humor, common sense, and a positive media outlet for those in the oil field. As I talk about my day here on AM 1090 KTGO, I wish I could call it work but nothing is work when you find your passion in life. I found my country, my people, my native language. I have family and friends. I have a fighting patriotic spirit for this country whether I’m scrubbing toilets, flipping burgers, or selling diesel. After a brutal but fulfilling day’s work, I run home to reach out and articulate to all of you in search for the same hopes and dreams. THANK YOU MY COMPANY MEN. Eric Olsen is an independent oil prospector. He has a Petroleum Engineer degree from Montana Tech in 1974 and finished Masters in Petroleum degree program at Colorado School of Mines in 1985. Eric was married to Diane in 1980 and they have four children and two grandchildren. Eric Co-founded Montana Shrugged Group with his daughter Jennifer in 2009 with a current roster of over 6300 members. As grassroots organizers we promote Constitutionally limited and fiscally sound governments. Check us out on Facebook at Eric Olsen and Montana Shugged. Eric has recently become the State President of Eagle Forum as they have parallel support for family, religious, Constitutional, and fiscal issues in America. Check out the amazing information available at www.eagleforum.org. Eric has been active in Montana supporting good conservative candidates in local, state and federal offices. He had a cable television interview show for over a year and has been on many radio shows as either a guest or a cohost as with Bella Dangelo show.